Bray is one of the original members of the Mall Rats. He appears in series one episode one. Tribeworld describes Bray as a handsome, confidently cool and enigmatic adult boy. He is a natural loner, content with his own company and an experienced warrior and activist. He distrusts all leaders and initially refuses to assume his natural role within the tribe. On the surface, he is very sure of himself, inside, he is a turmoil of emotions. After the death of his parents, Bray is unable to prevent the mental breakdown of his younger brother, Martin, and his transformation into his Zoot persona. The two brothers grow apart as Bray tries to build a new peaceful world without the adults, and Zoot takes power over the city. In series one Bray first comes to the Phoenix Shopping Mall hoping to find a safe place for Trudy to stay, as she is pregnant with Zoot's child. At first, he is not welcomed by the other Mall Rats, as he keeps disappearing from the Mall and shows no real interest in the tribe's future. But, little by little, he becomes a sort of father figure for the youngest ones and agrees to be in charge of finding provisions. He quickly develops a relationship with salene, breaking Trudy's heart. Bray develops a strong rivalry with Lex, who cheats his way into becoming their leader. Bray thinks Lex's only concern is himself and not the Mall Rats, especially after he tries to get rid of Bray, by placing stolen bottles of water in his room. Bray is almost kicked out of the tribe, but he puts his rivalry with Lex on hold when the virus again hits the city. Bray takes part in the Mall Rat's search for a possible cure. 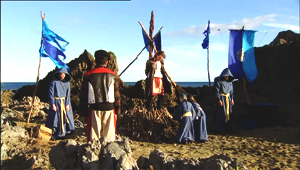 Along with Amber, Lex and Dal he finds a sample of the antidote on Hope Island. After Tai-San and Lex both start to show the first signs of contamination from the virus, Bray hopes one of them will try the antidote, but they refuse to take it. Ebony and the Locos save the Mall Rats from Tribe Circus, but as a reward for their help, they take the antidote samples, and make Bray and Lex prisoners. 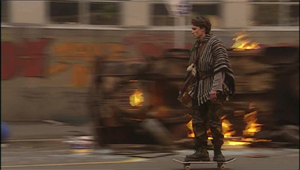 After the Locos force him to take the antidote, Lex is cured and Bray convinces Ebony to leave the Locos and to join the Mall Rats in their search for the antidote's formula before the virus kills them all. During series one, Salene confesses her feelings for Bray and they share a kiss, but Bray soon realizes he does not love her. Trudy, who has always loved Bray, suffers from postnatal depression and uses her daughter, Brady, to guilt Bray into taking care of her. Bray worries about them, as Trudy becomes increasingly jealous and even attempts to kill herself. He feels conflicted, having developed strong feelings for Amber, but not wanting to abandon Trudy, who has become a single mother after Zoot is accidentally killed by Lex. When Amber has a short-lived relationship with Sasha, Bray starts to feel depressed and even considers leaving the Mall Rats. Amber and Bray finally confess their feelings for each other, and as proof of her love, Amber gives Bray her father's ring. She becomes jealous of Bray's relationship with Ebony and Bray tries to reassure her, telling her he has no feelings for Ebony. But when Ebony joins the Mall Rats on their trek to Eagle Mountain, Bray realizes Amber still has doubts about their relationship. Prompted by Lex, they make up and along with the other Mall Rats they hear a cryptic message that was left behind by the adults. In series two a generator catches fire on Eagle Mountain, and Bray is knocked unconscious, Lex tells him Amber and Zandra have died. At first, Bray is so distraught over Amber's death he decides to give up on the antidote and leaves the Mall Rats. However, Bray quickly realizes Amber would have wanted him to keep fighting. The Mall Rats all go looking for the antidote with the information Jack found on Eagle Mountain. On his search of an abandoned government building, Bray meets Danni and gives her the chance to join the Mall Rats. Lex, Ebony and Tai-San find the antidote and the Mall Rat's give it out for free to the other tribes. Tai-San is the only one who knows the antidote's formula, and after an explosion of her lab, she decides to share it with Bray. Brady and Trudy are kidnapped by the Chosen and Ebony tricks Bray into giving her the formula by threatening to leave the Mall without telling him where the Guardian is holding Brady and Trudy. The Mall Rat's go after the chosen, but fail to rescue Trudy and Brady. Bray and Danni soon develop feelings for each other, as they share the same ideas of a united society. When Danni is put through a trial for trying to poison Tai-San, Bray defends her, as he is convinced Ebony is behind this. Ebony puts the blame on Spike, and Bray is unable to prove her wrong. Later in Series two, Danni reveals her father was partly responsible for the virus that killed all the adults, and Bray forgives her for hiding it, telling her it was not her fault. Bray is elected as the leader of the Mall Rats, but has difficulty assuming his duty while also having to make more antidote. Against the wishes of the others, he elects Ebony as Head of Security to help him, as she still controls many of the ex-members of the Locos. When Trudy returns, Bray is so relieved to have Brady back and to see that Trudy is accepting his new relationship with Danni that he fails to notice that Trudy has changed. At the end of Series two, the Chosen invade the mall, and Trudy finally reveals she has turned against the Mall Rats. Bray and the Mall Rats try to defeat the Chosen, but they are outnumbered and must surrender. 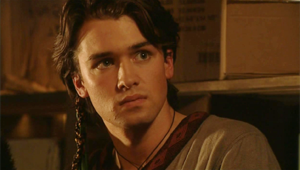 In series three after being taken prisoner by the Chosen, Bray learns Danni has been killed with all the other tribe leaders. 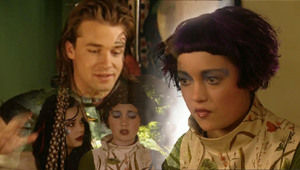 The Guardian and Trudy try to brainwash him in order to make him join the Chosen's cause. But Bray refuses and almost gets executed before being rescued by Lex, Ebony and Pride. Bray realizes Pride is wearing Amber's ring around his neck and discovers her grave on Eagle Mountain is empty. He soon finds out Amber is alive and has joined a tribe called the Ecos as their leader. Bray is furious at Amber for making him believe she was dead and begs her to help them rescue the Mall Rats and defeat the Chosen. After Amber witnesses the death of her best friend Dal, Bray and she rekindle their love relationship. Amber leaves to go look for more tribes to join the rebels, while Bray, with the help of Lex and Ebony, starts undermining the Chosen's power over the city. They destroy their gas depot and help rescue Trudy from their grasp. Bray is ecstatic when Amber returns and informs him she is pregnant. However, she is reluctant to keep the baby and Bray asks Trudy to have a talk with her about motherhood. After the Mall Rats successfully defeat the Chosen, Bray and Amber settle at the Mall and finally enjoy being together. Their happiness is short-lived as Amber and Trudy are mysteriously kidnapped. Bray becomes so desperate to find them he gives up on his duties as leader, which allows Ebony to slowly take power over the whole city. After Amber and Trudy are safely returned, Bray starts to believe Ebony was behind the kidnapping, but fails to prevent her election as the new city leader. When Bray and Amber confront Ebony about her betrayal she takes advantage of her new position of power and banishes them from the city. As they reach the city's limits, Amber goes into labour and they take refuge in an abandoned barn. At the beginning of series four, as Amber is still in labour, the Technos invade the city and Bray goes missing. Trudy finds Amber's ring outside the door. At the beginning of series five, Amber learns Bray has been deleted by the Technos. 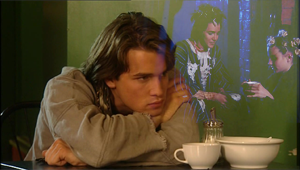 However, at the end of the series five, KC, who is imprisoned on a island, mentions to Alice that he was kept prisoner with Bray for a few weeks until they were split up. Bray's whereabouts unknown. In series one Bray wears loose dark brown cargo trousers, with large side pockets. A black long sleeve top covered with a light brown jumper. He also wears a leather vest over the top. He completes the look with leather boots and feathers and braids in his hair. As series one progresses he adds a brown and beige poncho and his top changes to white. By series two Bray is wearing heavier cargo trousers, with a white and black leather petal design on each side. These are paired with a black T-shirt which has threaded leather taping down the front in two parallel lines, he completes this look with a long brown leather jacket, leather boots and a large green jade necklace. Bray continues to wear his hair with feathers and braids. In series three Bray wears a white knit loose vest. His trousers are black jeans with white stitching. Three red stripes have been stitched into each thigh and two Maori design flaps have been sewn into the waistband - one at the front and one at the back. Bray continues to wear his black leather boots and adds a brown leather jacket to complete the look. 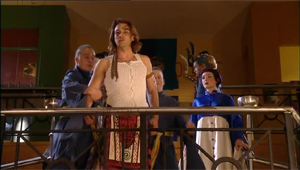 He also continues with the feathers and braids in his hair.